Calgary Blizzard will be hosting an Injury Prevention Coaching Clinic this Sunday November 4, 3-4:30pm at Calgary West Soccer Centre Field #4. 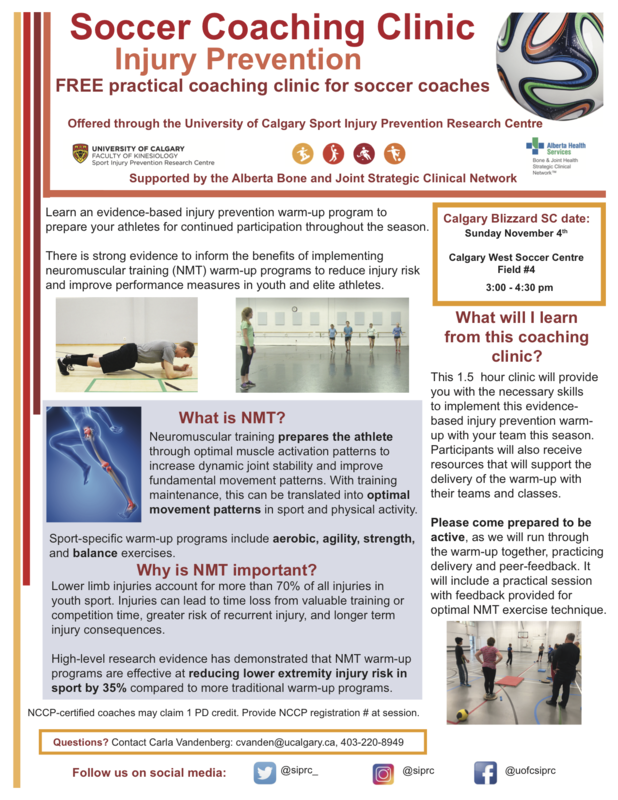 This clinic is run by Carla Vandenberg and the University of Calgary Sport Injury Prevention Research Centre. All coaches are encouraged to attend! This 1.5 hour clinic will provide you with the necessary skills to implement a evidence-based injury prevention warm-up with your team this season. Participants will also receive resources that will support the delivery of the warm-up with their teams and classes. Please come prepared to be active, as we will run through the warm-up together, practicing delivery and peer-feedback. It will include a practical session with feedback provided for optimal NMT exercise technique.